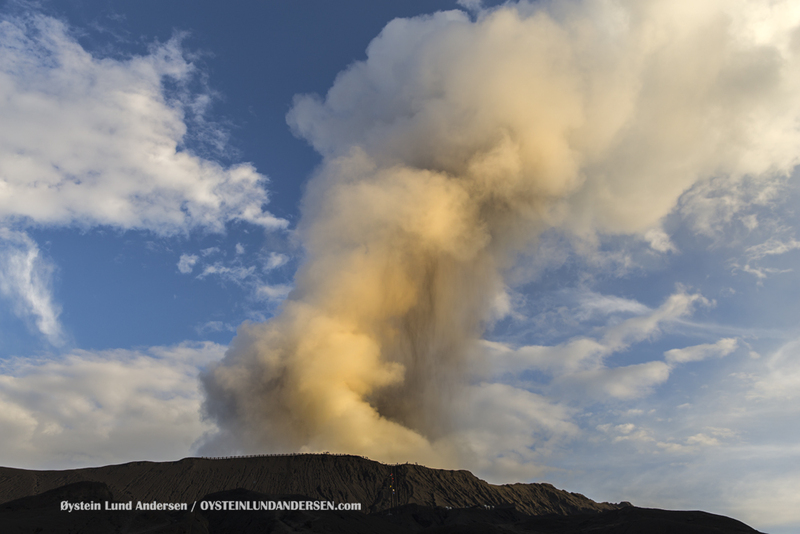 My 31th trip to Bromo, never get tired of traveling there, especially when there is eruptive activity. 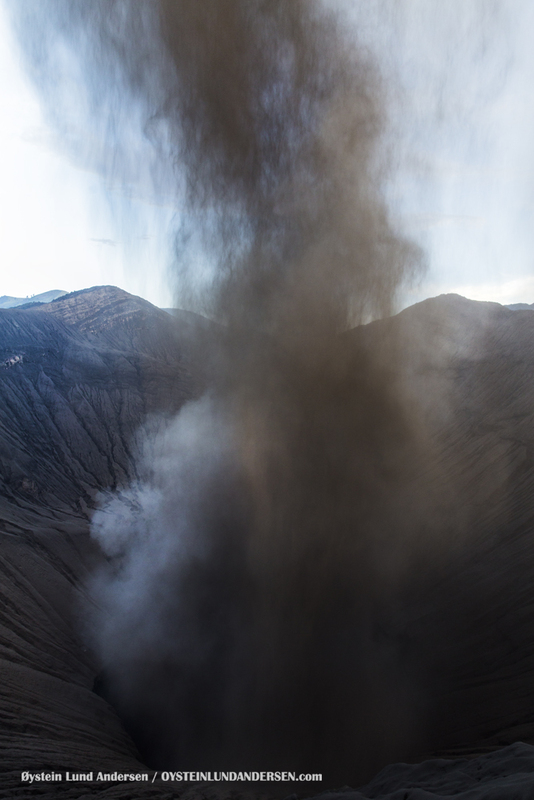 On arrival on the 3th June, Bromo was erupting steady column of ash, that rose to heights between 200-500m, and drifting West toward the city of Malang. 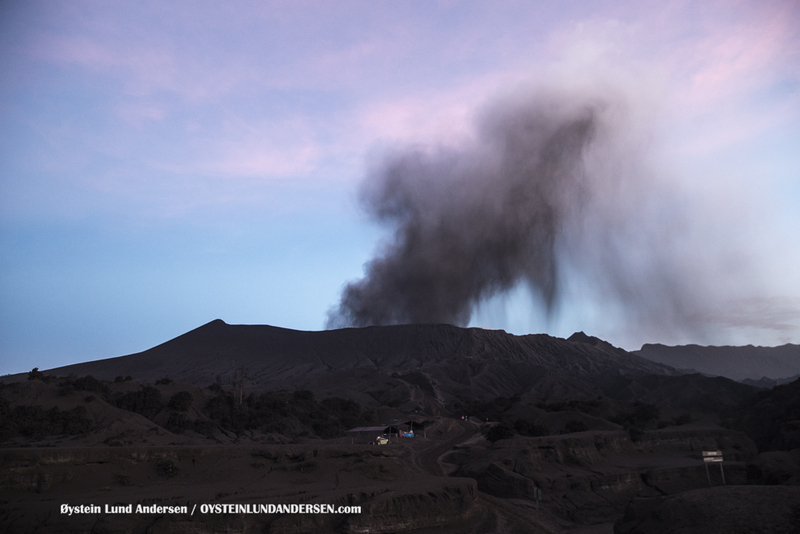 Late evening the eruption ceased and the volcano was seen only emitting steam in the morning/midday of 4th June. 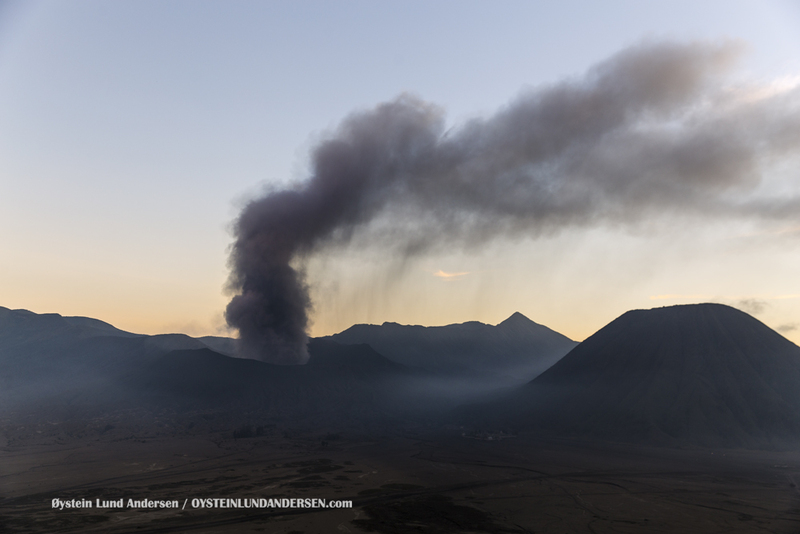 During this period of calm a period of degassing started, and emitted a body of sulfur gas that could be easily recognized by the nose several kilometers from the volcano. 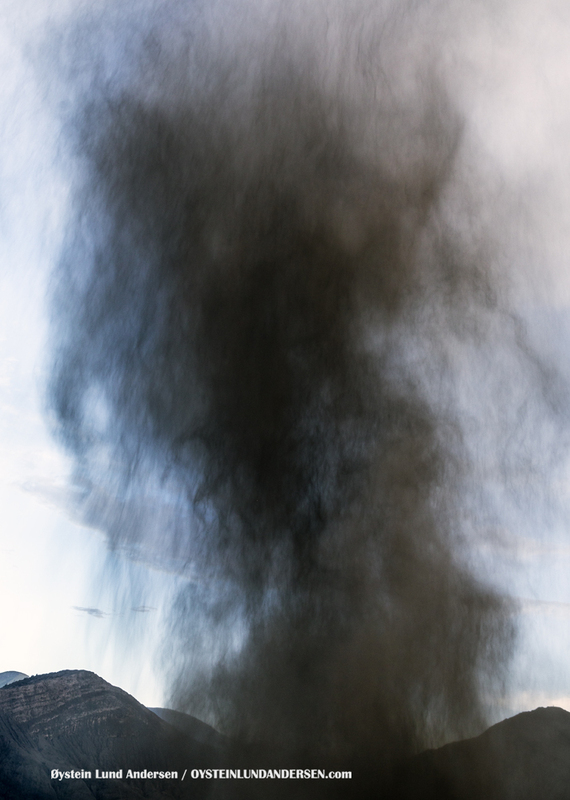 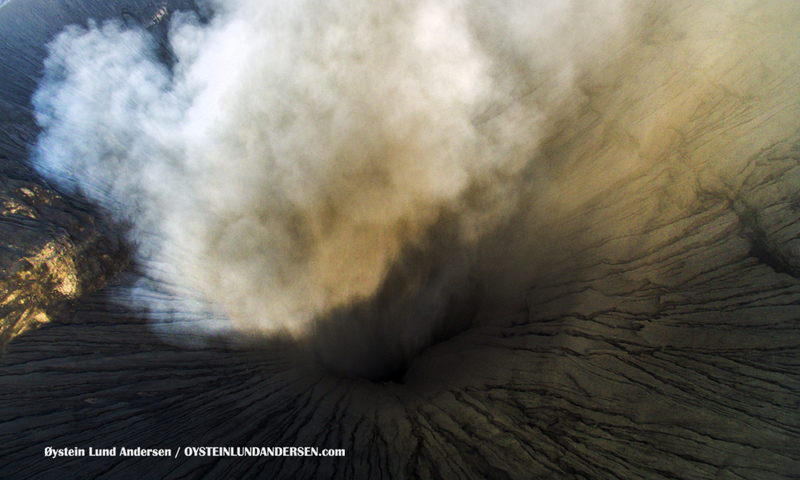 In the afternoon of the 4th, the volcano had again started to erupt. 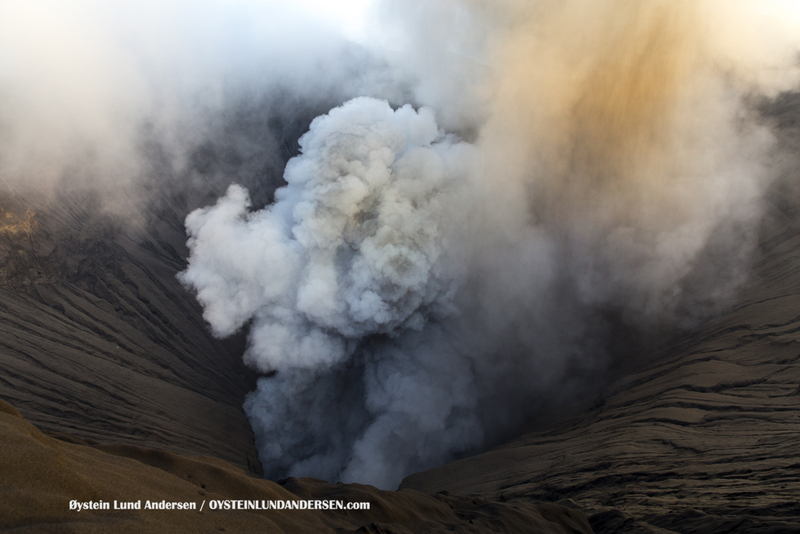 During a visit to the crater area in the afternoon, the volcano was erupting ash, but the sound of moving/ejected rocks were also very evidently heard from the crater edge. 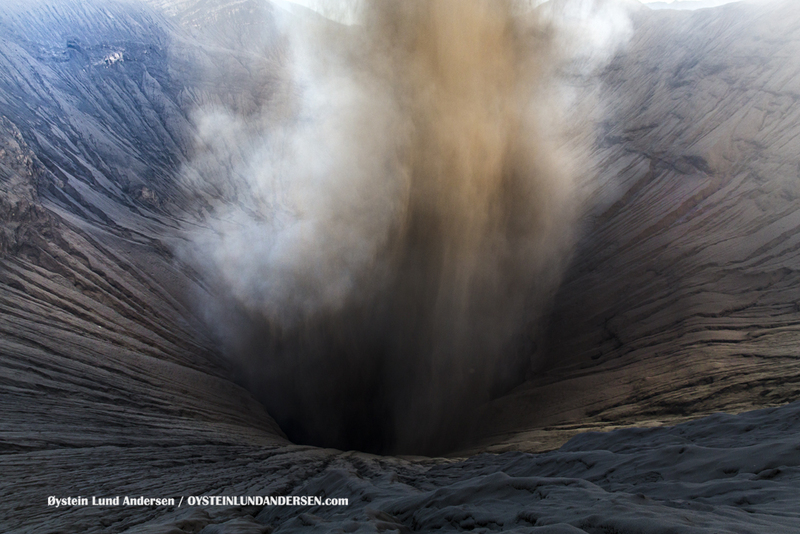 Some rocks were also seen ejected from the crater, however did only reach 20-30m above the bottom of the crater, and did not make it over the crater edge. 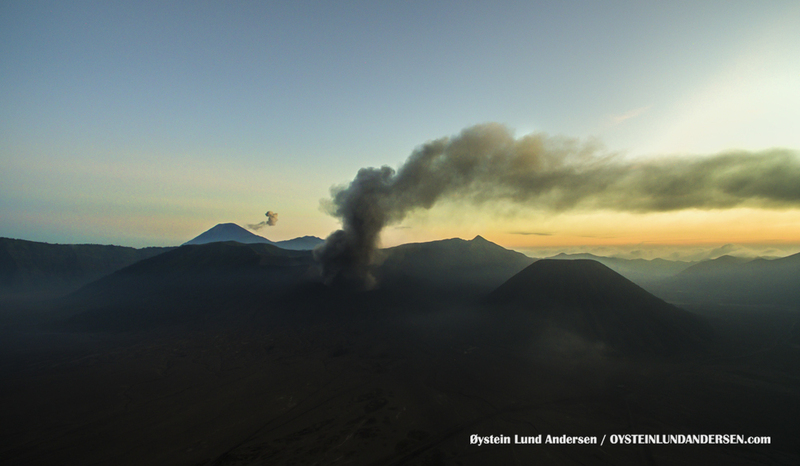 On the morning of the 5th June the volcano was quiet again, and only a small degassing plume could be seen, and even sometimes faded and the volcano was totally calm. 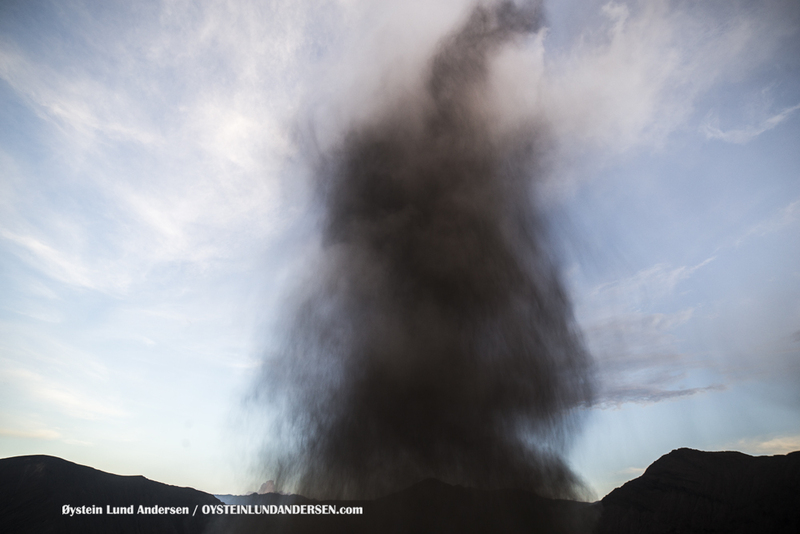 Eruption plume in the afternoon of the 3th June reached 400m in height before drifting West. 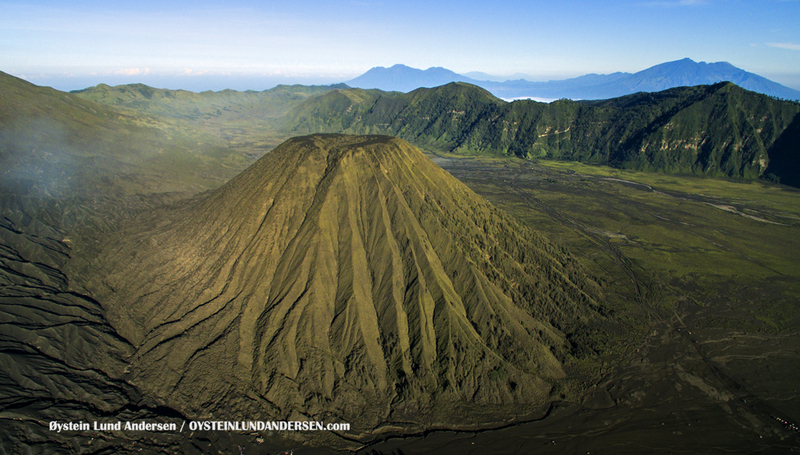 Aerial photo during dawn. 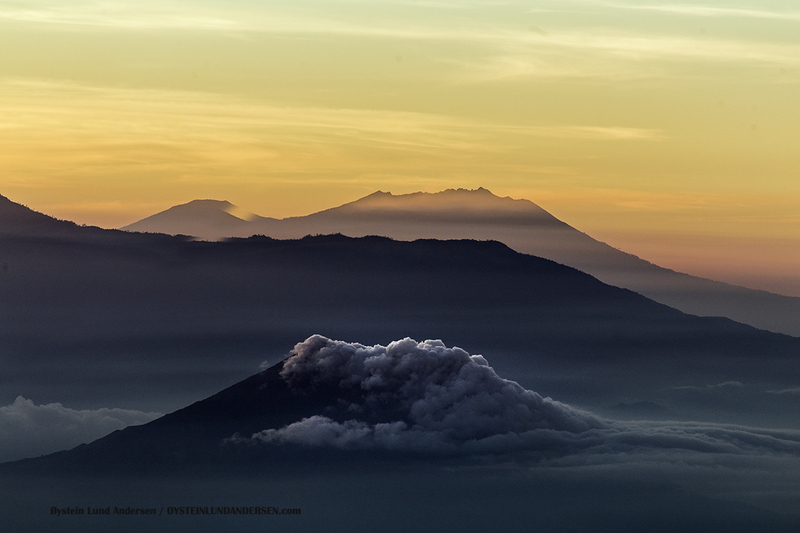 Semeru seen in the background having just released a ash-plume. 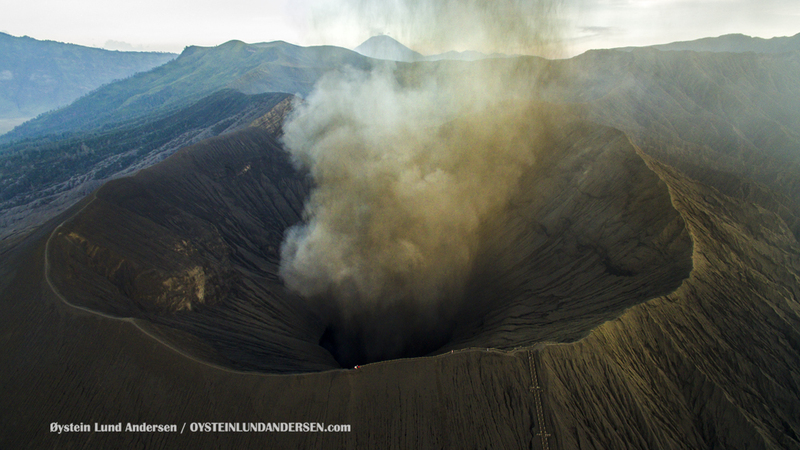 Bromo engulfed by degassing, the gas contained much sulfur. 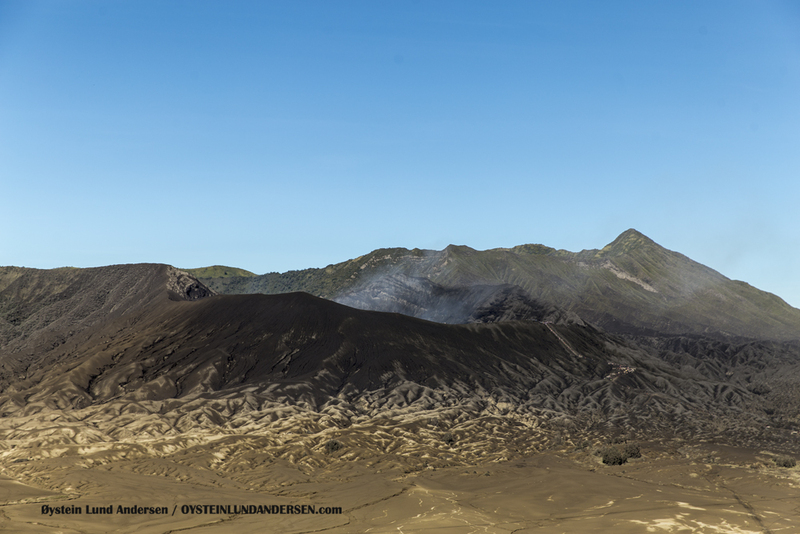 Mountains East of the Tengger Caldera. 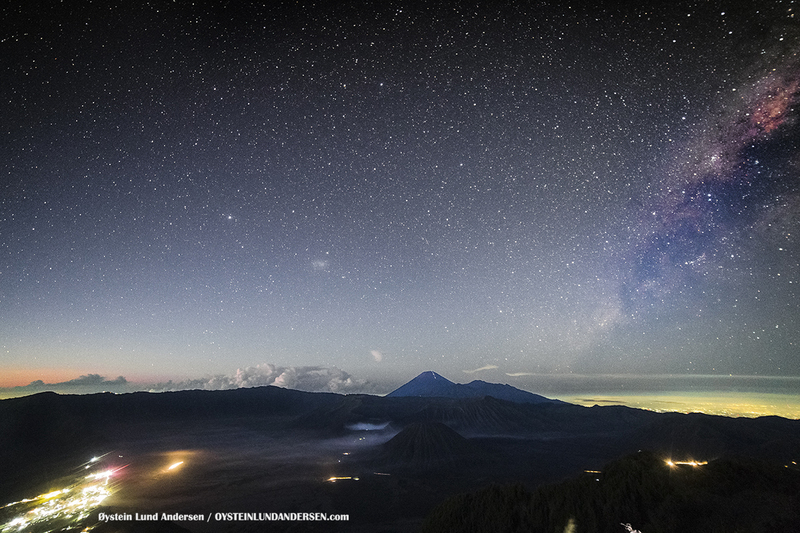 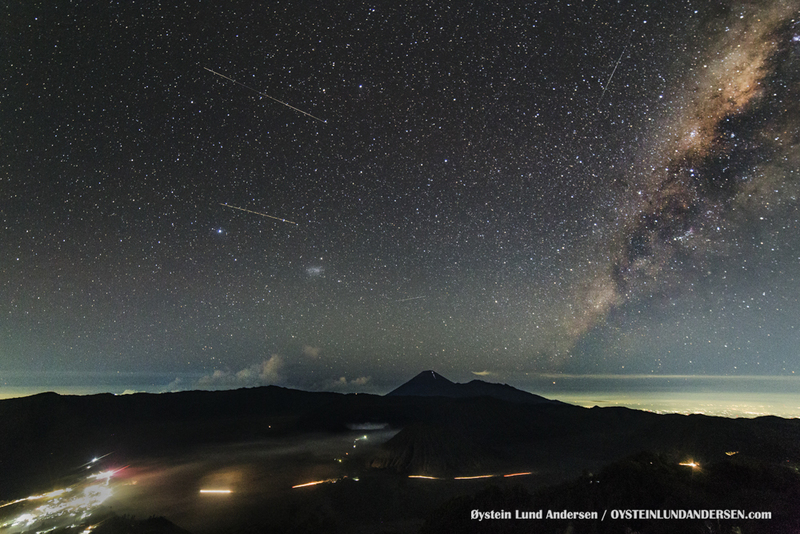 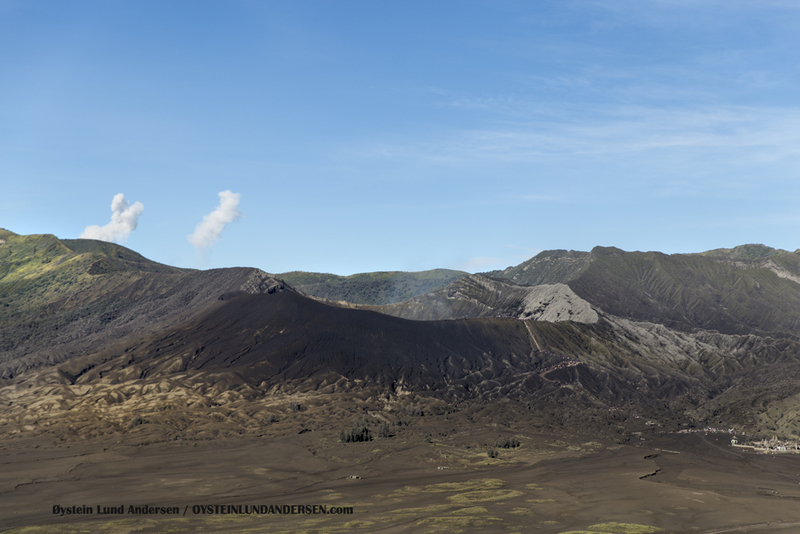 In the middle left is Argupura, and furthest in the back is Raung. 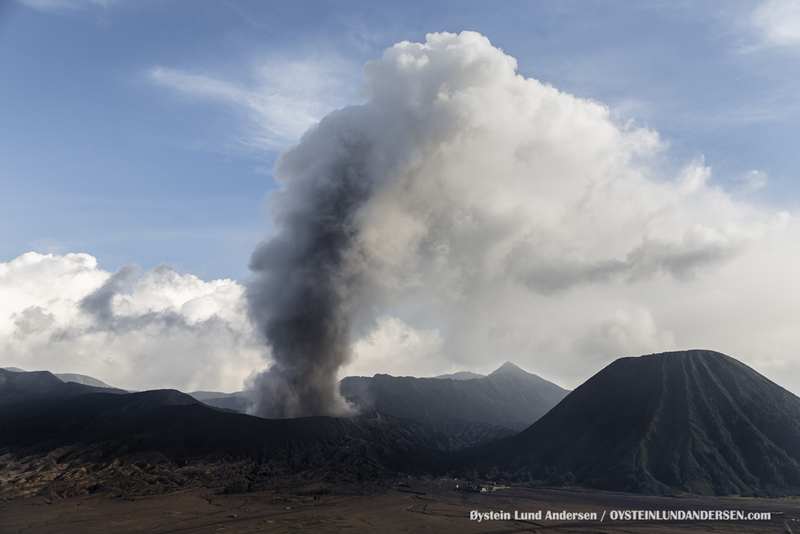 Eruption reached 500m in height. 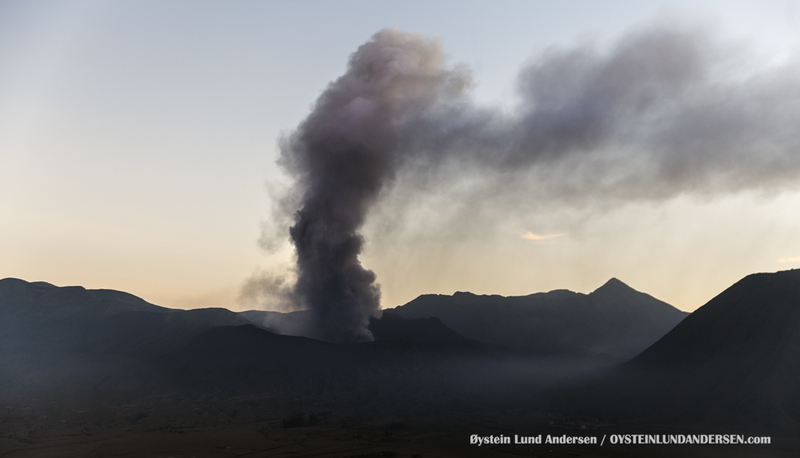 Eruption contained small/medium quantities of ash, seen falling under the eruption plume. 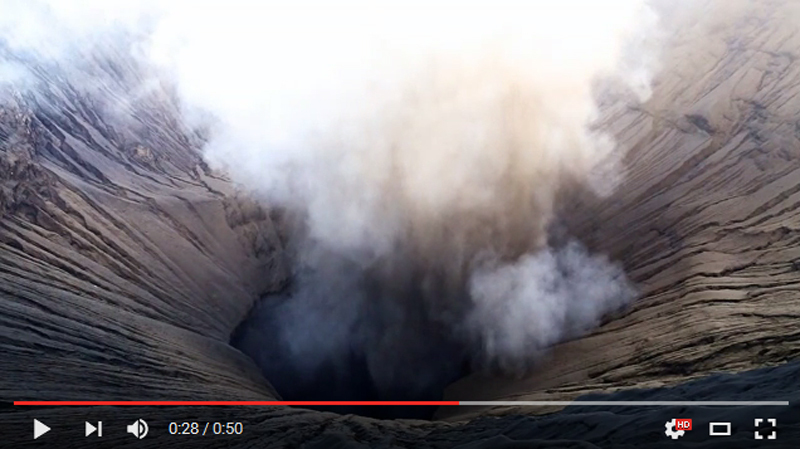 A glimpse in the crater. 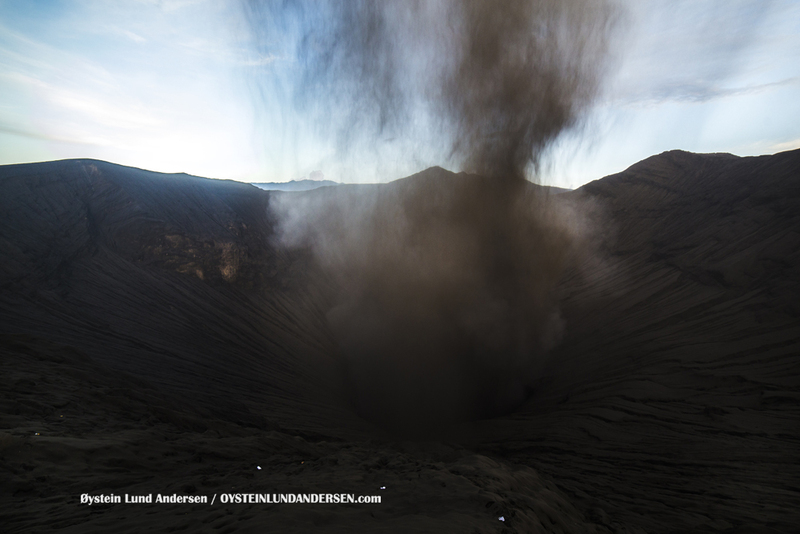 The eruption sound was signified by the sound of falling rocks, however the rocks did not travel far from the bottom of the crater. 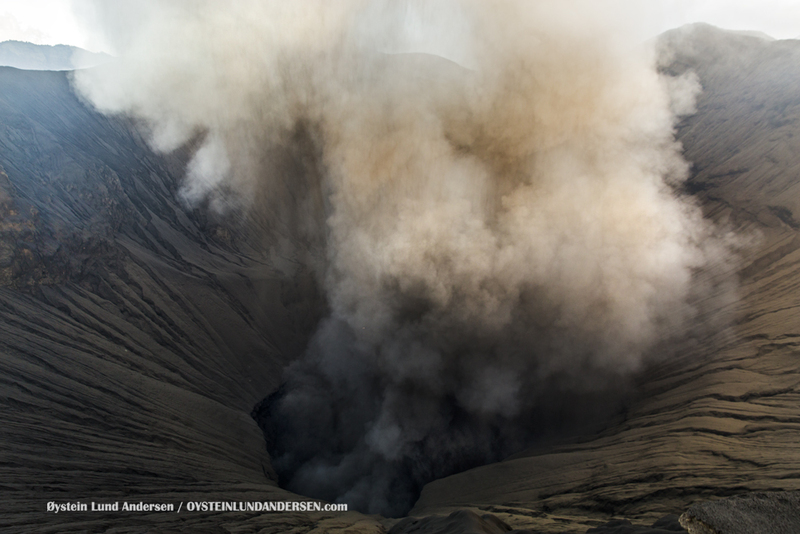 Ash are being propelled upwards and some of it falls back to the crater, leaving streaks under the plume. 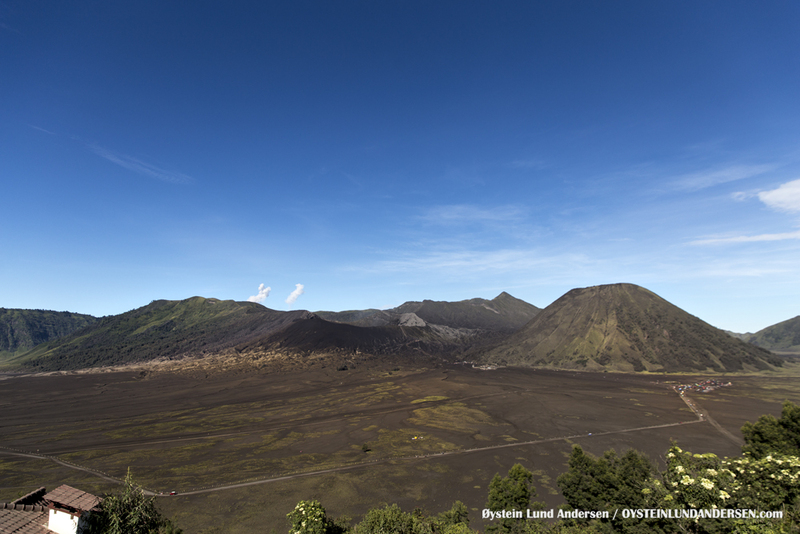 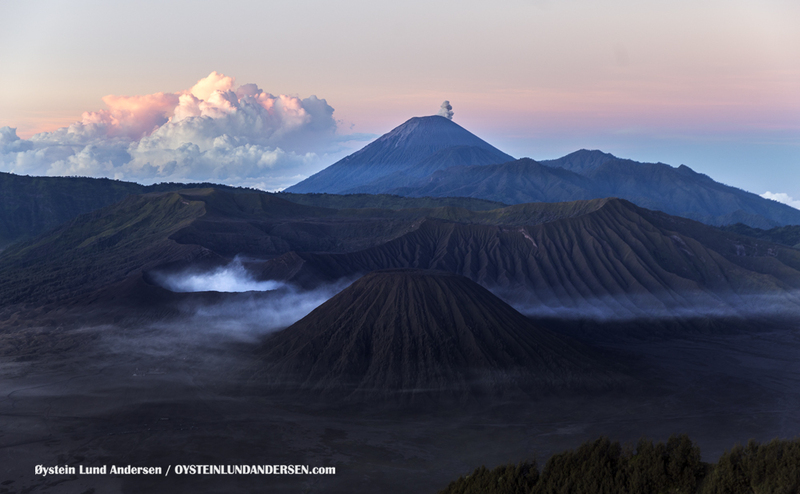 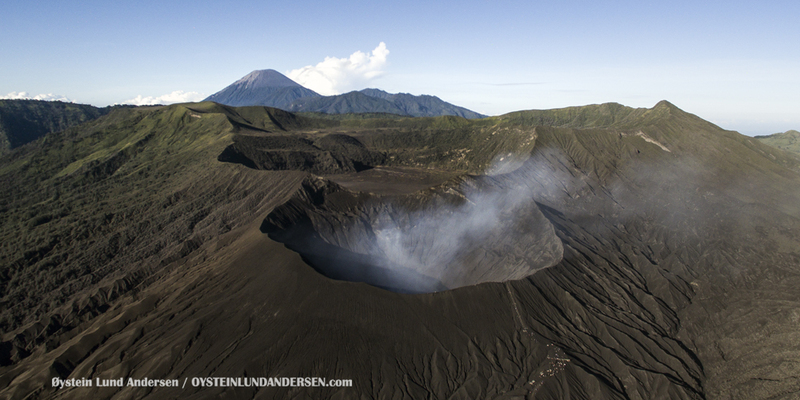 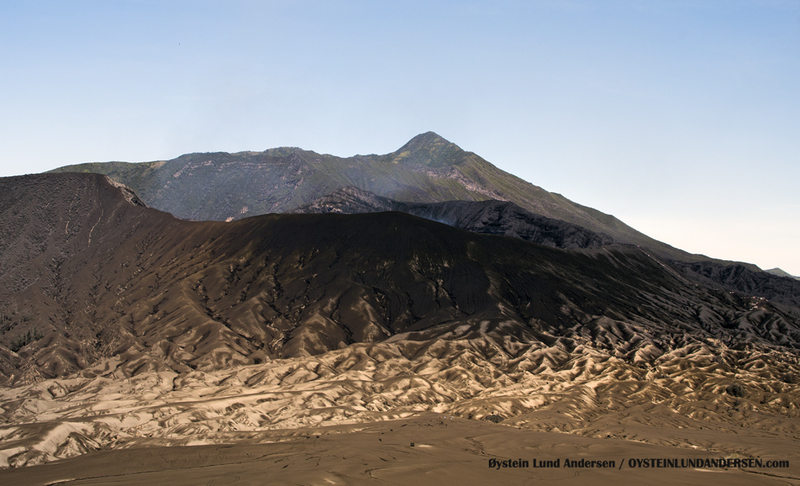 The extinct Batok volcano, the volcanic-cone next to Bromo. 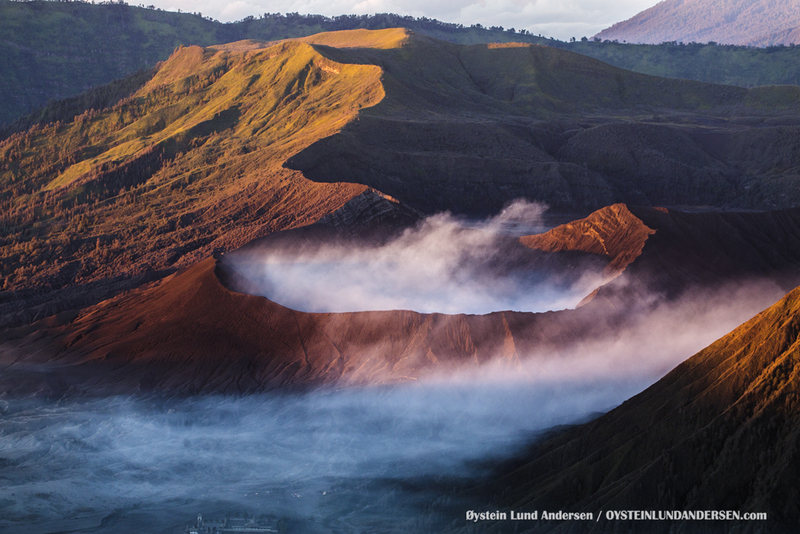 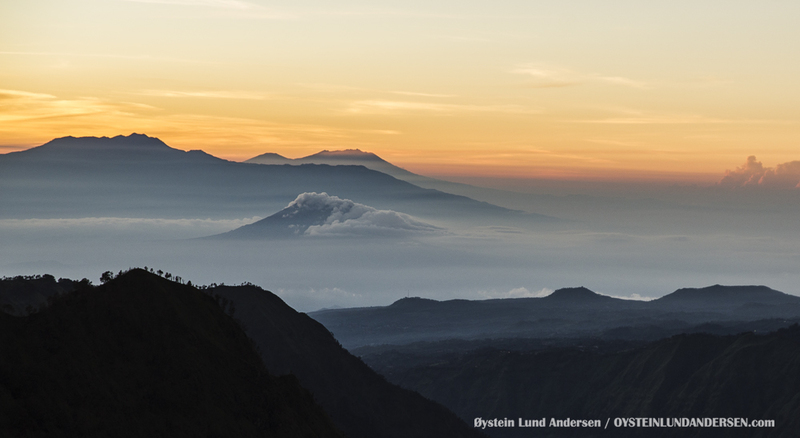 A very clear morning at the edge of the Tengger caldera. 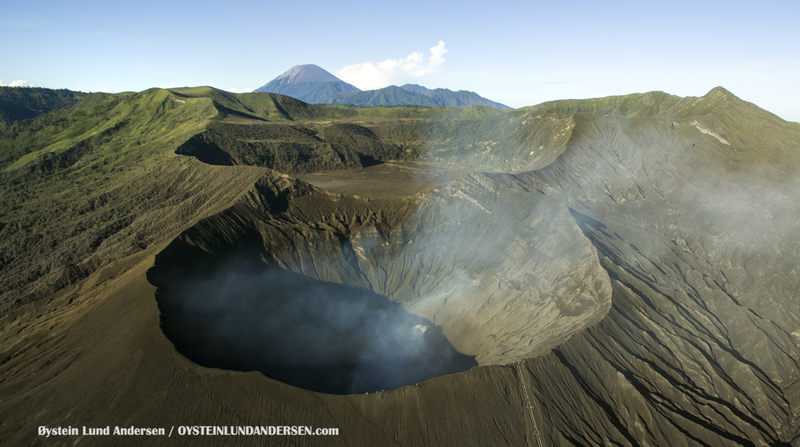 Bromo is very quiet this morning.